For 25 years Optical Filters has been at the forefront in the innovation and development of EMI/RFI shielding solutions for display and windows. The 2nd Generation EmiClare MicroMesh is the latest in a series of products that started with the original EmiClare woven wire mesh. As displays continue to evolve in size and definition, the new generation MicroMesh offers the combination of higher light transmission and shielding effectiveness that is not achievable with ITO coatings. 2nd Generation EmiClare MicroMesh is the result of Optical Filters continued R&D program and maintains the principle of innovation by combining the fine line conductive printing process as introduced with our EmiClare LaserMesh with the display-optimised pattern that has made EmiClare MicroMesh the leading solution for shielded displays and touch screens. A line spacing of 300µm (85opi) is the optimum pitch for electronic displays and is a common specification for all 3 products. The improved 2nd Generation EmiClare MicroMesh product offers the benefits of the scalloped aperture shaping for improved control of moiré fringing together with finer line width which gives more open area and better light transmission. Displays with 2nd Generation EmiClare MicroMesh will be brighter and shall be more readable in all conditions. 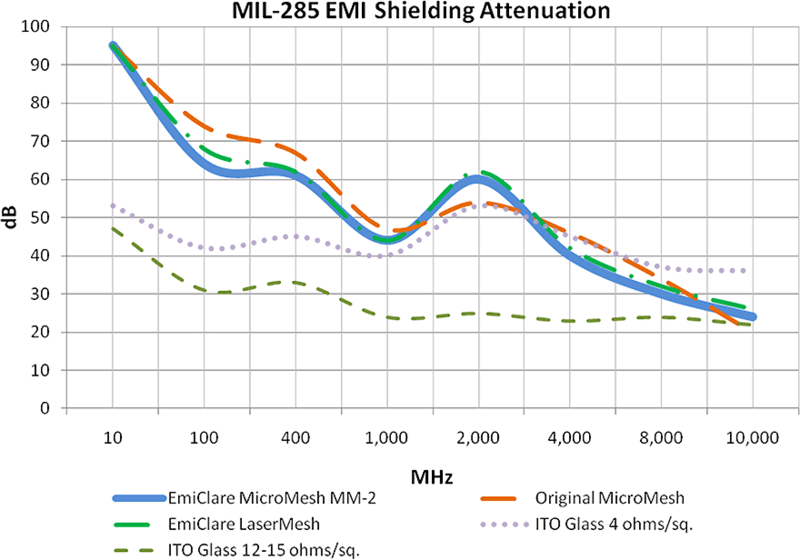 In addition to increased Photopic Transmission the dull black finish of all edges on the 2nd Generation EmiClare MicroMesh reduces Diffused Reflectance and improves the sunlight readability when compared to with exposed copper in a photo etched MicroMesh. The subtractive photo-etched process to form the micro-replicated conductive grid in MicroMesh manufacture results in a diffused aperture that requires a secondary lamination to make an optically clear filter. With a deposition process the aperture of 2nd Generation EmiClare MicroMesh is clear removing the requirement to fully optical laminate.